The following two pictures illustrate the effect of moving the vanishing point around the page. As you can see, the placing of the VP has an immense effect on the outcome of the drawing. To make your name display, the teacher should first make a name page for each child in the class. This page can be created using WordArt. Make sure that you use first names only (which should fill most of an A4 page), and change the text colouring to white and add a thin black border to the text. 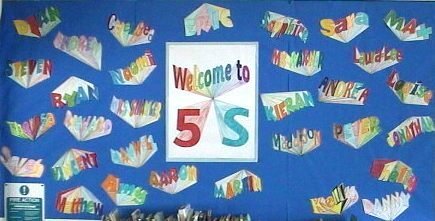 When you have your name pages, ask the children to use the above technique to make them look 3D. When this is done, they can colour their names (using random colours, or using a pattern if desired). These should then be cut out (by the teacher, as the names can be tricky to cut) and stuck on to your display. You could also make a "Welcome to..." sign to indicate the name of the class as in the above photo. This can be done by making 2 A4 name pages (with "Welcome to" on one page and the name of the class on the other). The pages should then be enlarged onto A3 paper and stuck together. Then, draw a vanishing point in the middle, and make your picture look 3 dimensional! What a lovely idea ! May I give this a go with my Arts class ? Create an amazing Starburst display, by drawing some dots and a few straight lines!